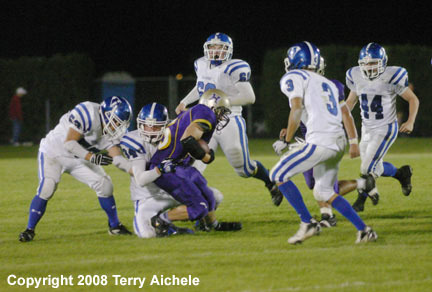 Tyler Green of Hermiston runs through the opening the Bulldog line created. 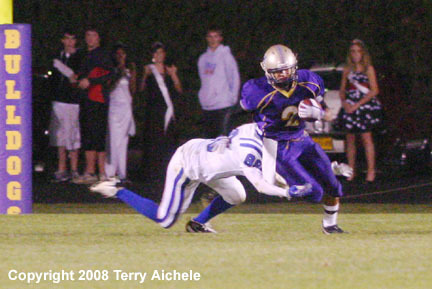 HERMISTON - Hermiston High School hosted Hillsboro of the 5A NW Oregon league for their homecoming on Friday. The Dawgs had no problem moving the ball and scoring fast. It seemed like Hermiston could put points on the board almost at will. One example was at 9:40 of the second quarter when Paul Lloyd intercepted a pass and returned it 25 yards for a touchdown. Just over a minute later at 8:34 Faafiaula Ena connected with Luis Ortiz on the first play after a Hillsboro punt for a 46 yard touchdown. By that point Hermiston was ahead 36-7. Ena even got the chance to score a touchdown a quaterback keeper at the 10:42 mark of the 4th quarter which, with the extra point, gave Hermiston the 43-7 final score. 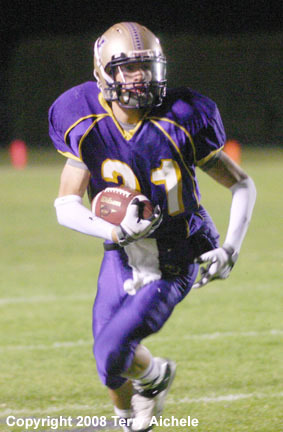 LEFT - Paul Lloyd returned an interception for a touchdown in the second quarter to give Hermiston the 29-7 lead. 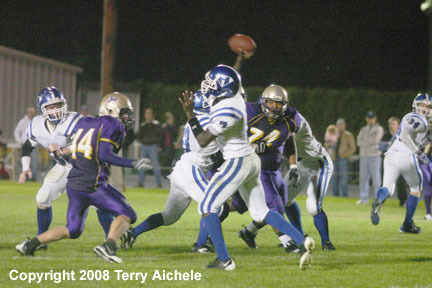 RIGHT - Hillsboro quarterback Dominique Mims throwing a pass in the second quarter. LEFT - Luis Ortiz outruns a Hillsboro defender on his touchdown run after catching an Ena pass to give the Dawgs a 36-7 lead in the second quarter. RIGHT - Luis Ortiz carrying the ball with a Hillsboro defender trying to wrap him up for the tackle. 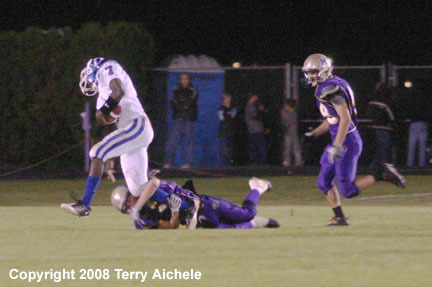 LEFT - A Hermiston defender grabs Hillboro's Dominique Mims' leg in an attempt to tackle the quarterback. 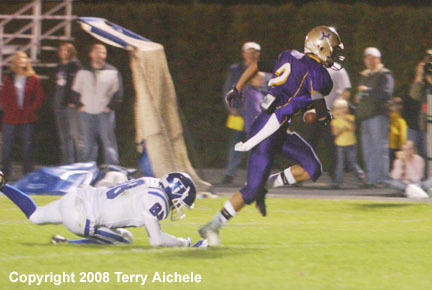 RIGHT - Hermiston's quarterback Faafiaula Ena hands off to Ben Wood. 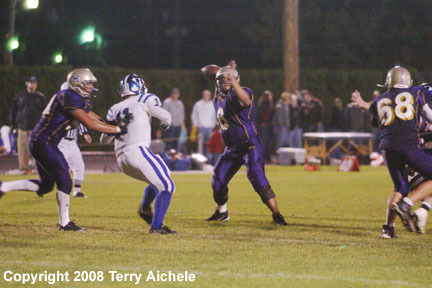 LEFT - Faafiaula Ena of Hermiston sets up to throw a pass during the game. 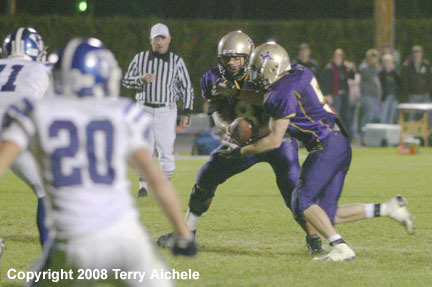 RIGHT - Ben Wood, Hermiston running back, is tackled by a Hillsboro defender.